Richard Ancheta first began to paint at the age of 12 years old and took painting lessons with well known Filipino artist and illustrators. His devotion and vision as an artist are promising. He studied Multimedia Design at Montreal International Academy of Design. Richard works in various mediums: oil, acrylic, watercolor, pastel and charcoal. His works have been featured in newspapers, magazines and books. He boasts 20 years of experience in painting, illustration, advertising and graphic work. 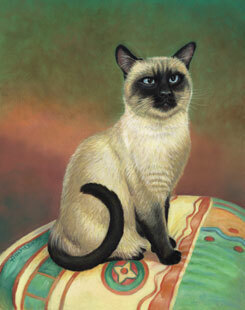 These are the three photographs of a Siamese Cat name Siegfried and the owner asked me to paint an original oil portrait – a birthday gift that will last forever. 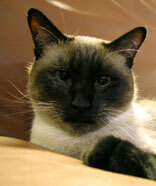 Good reference photographs are important to capture the likeness of the model. Let’s begin the challenge! Sketching is the backbone of the painting, failing to be precise in this stage will suffer retouching again and again in the following stages. Precision in the early stage will merit all the trouble of minimizing the errors, the draftsmanship of the subject. The tone values will be rendered and will forecast the result of your painting when seen in black and white. I use an ordinary HB pencil in outlining the drawing and add tones to where you will drop the values of the next coloring stage. After the sketch is completed, I lightly spray with fixative to protect the pencil from smudging. Glaze the whole canvas with the subject’s middle tone. 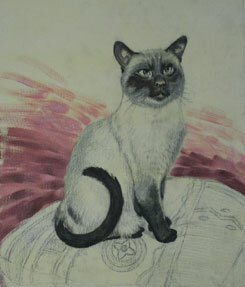 As the cat has a pale yellow ochre (acrylic), it dries quickly. Again, it protects the drawings from smudging and eliminates the brightness of canvas. 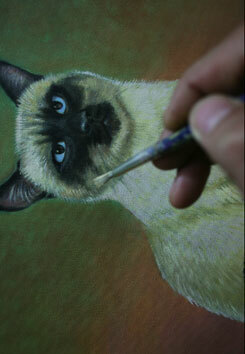 It helps also to close the pores of the canvas in which sometimes you will leave small dots of whites. Oil painting begins. I start painting the darks by mixing burnt umber and vermilion and cobalt blue. With this three-color combination, softer blacks are created, rather than using solid ivory blacks that create unevenness and holes on the canvas. However, solid ivory blacks give depth when used in the pupils of eyes. Blocking determines the weight composition of the lowest value. Anticipation of color contrast is also important and forecasting that in the end of the painting session the colors will be harmonized and let the main subject stands out. I choose hot colors for backgrounds and balance them with harmony cool colors of blue-greens, repeating the colors from the pillow. The value of color plays the mode of the whole painting. It gives expression. Hot colors focus the eyes; and to balance the breathing, cool colors minimize their intensity. • Hot colors: red, orange and yellow. I prepare to blend the backgrounds by using a fan brush. For more softer and subtle effects, eliminate intricacy of brush strokes that steal attention from the overall impact. Tone gradation is a technique that I use in my paintings because it classically and smoothly divides the transition of values. It simply defines, as from dark to light gradation. Why invert the painting? Removing the picture image from your eyes allows greater concentration and eliminates developing a series of tones starting from the highest value, the white. Inverting and/or rotating the canvas make strokes easy, allowing for texture and fur directions. the start immediately covers the large canvas space. Shifting to medium and very small brushes allows for organizing and improving the speed of your painting process. In this stage, I demonstrate the trick of flattening my round brush to create a chisel mode for my brushstrokes in order to create very tiny lines for fur texture. top of the colors gives more dimension as you approach the satisfaction of declaring the painting finished. My final stage is visualizing subject volumes and impact of highlights. Add some touches; redefine shade and shadows. Let the painting dry, then varnish repeatedly until achieving the desired luminosity. Don’t forget to sign your painting. Thanks so much for your comment Richard! Means alot to me! I have bookmarked your blog and look forward to viewing it often. Your cat is fantastic! Thank you so much I have looked on some many websites for information of how to blend colours and in two minutes you have explain so much. I can not tell you how much time I have wasted trying unsuccessfully to blend colour only to find it is easy using your method. Now I will be able to sleep at night and impress my art teacher. Thankyou. 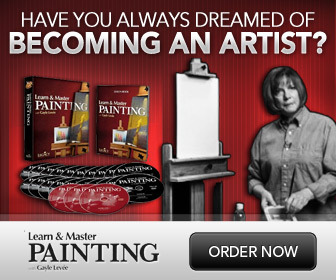 What wonderful lessons on painting keep up the great post. I hope to learn much more. Well explained with the most important steps depicted. it should have been said that the time one should wait for varnishing is usually from 6 months to 1 year; I usually apply a retouchable varnish in spray after 3 months, very lightly. 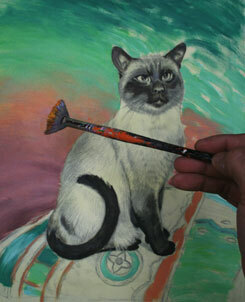 Then after the 6 or 12 months, I apply the final varnish using a good (that doesn’t lose hairs) wide brush. Some disagree about using graphite since it has lubricant porperties, but I don’t know of any less good reports, at least make sure to use a fixative. Please take a moment to visit Richard’s site and let him know how much you enjoyed his demonstration. I know that he would be delighted to hear from you. I enjoyed your painting demonstration of the cat. I am still a beginning painter and I do landscapes that do not require much drawing. I would like to try more detailed work and your instructions on drawing and doing a value sketch with an HB pencil helped. 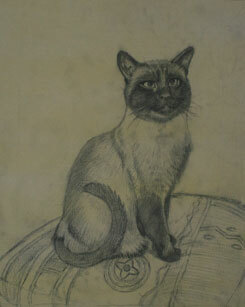 I have 2 questions: What kind of fixative should I use after I have done the drawing? Also, what is the glaze made up of? If it is the middle value of the subject of the painting, doesn’t it cover up the drawing and it’s detail? That’s really nice, informative and useful. I am amused at the way you described the whole process. Thanks a lot. Thank you so much for your advice. It’s a great demonstration that I will try to put into practice next time I create one of my cards. I have been mainly working in oil and acrylic to date, but I am really looking forward to turning my hand to oils. 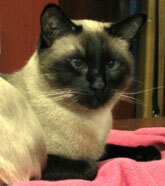 My dad is 90 years old and had a female Siamese. 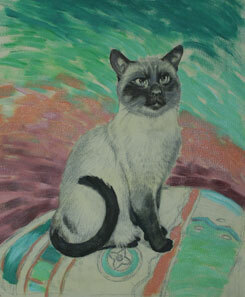 He has been bugging me to paint a picture of his cat. 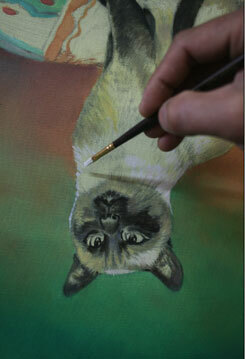 I struggle with fur but have decided to paint a cat face on a goose egg. I paint using acrylics, but with your tutorial, I believe the job can be done. Thanks so much for sharing!! !Its unusual and I greatly appreciated it. Hi, thanks for the detailed steps – as a beginner it help my confidence to have something to follow to start with. I’m interested in how much quality of brushes will affect my art – just bought some which I may have to wrap in Tamper Proof Tape and hide in a safe from my kids they’re that expensive! Wow thanks for so much detail, the end result was amazing. 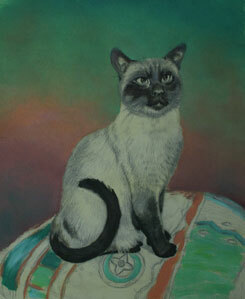 I might just have to try my hand at painting a cat because you made it look a lot more easy than it really is. Thank you for sharing. It is only people who are really SURE of themselves, that will share their techniques. I have tried SO HARD to paint in a really impressionist style, but without true success. Looking at your painting, just soothed me and straightened out my mind – i.e. I am allowed to paint “realist” Thank you. The Lord bless you. 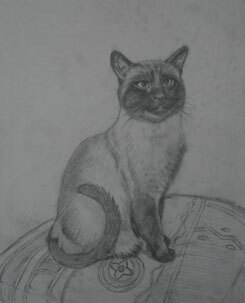 I had a great time reading the instructions posted in here regarding cat drawing. I already had done mine, and your guideline is really helpful. I thought before that I could not do it. Anyway, do you have specific brand of brush you use? Thank you ever so much!!! What?s Taking place i am new to this, I stumbled upon this I have discovered It absolutely useful and it has aided me out loads. I am hoping to give a contribution & aid different users like its helped me. Good job. My daughter is a young developing artist. Painting is her favorite type of art. She has really just started practicing with painting animals. 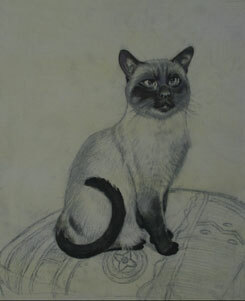 Getting the small details that give them the sense of realism has been a challenge for her. I am anxious to share this with her, I think it will be of great help.